We have a lovely Japanese Spitz male, who is a proven stud dog . 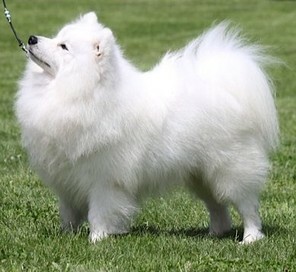 He is an excellent example of a Japanese Spitz, who is show quality.& is titled a Australian & New Zealand Champion and has won many Groups both here in New Zealand and also in Australia. He is an outstanding moving dog, with correct confirmation & wonderful pigment. Excellent with children and he is a happy well rounded boy , who is always smiling. He is a wonderful all round dog .